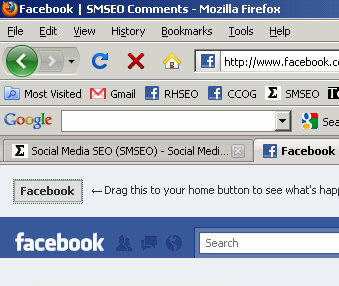 Question – how many of you have Facebook set as your homepage on your web browser? Meaning, when you click to open your web browser (Internet Explorer, Chrome, Firefox, Safari, etc…) Facebook is the first thing to load? You see the gray looking “Facebook” button? I was able to drag it to my homepage button in my browser bar, and it set Facebook as my homepage. Setting Facebook as your homepage makes sense actually since more than likely, it’s the first place you go when you open your web browser. And I would say that setting Facebook as your homepage will become even more popular as the new Facebook messaging service is released. So how many of you already have Facebook set as your homepage?